​Mohamed Salah's second-half penalty was enough for Liverpool to secure a 1-0 over Brighton at the Amex Stadium. Both sides had decent opportunities to score in the opening 15 minutes, as Robert Firmino perhaps should've done better with Andy Robertson's cross, while at the other end, Glenn Murray could only direct a header over at the other end from only 11 yards out. In a half dominated by Liverpool possession, Jurgen Klopp's side failed to break down a resolute Brighton outfit, with Xherdan Shaqiri's glancing header that went narrowly wide on the half-hour mark the closest the Reds came as both teams went into the interval on level terms. hauled to the ground by Pascal Gross inside the area. Gross almost made amends eight minutes later, although his effort was blocked well by makeshift centre-back Fabinho, before Alisson took no chances to turn Jurgen Locadia's strike from distance round the post. Georginio Wijnaldum saw a strike from distance whistle past David Button's post in the final ten minutes, before Salah fluffed his lines two minutes from time with a scuffed finish, but it didn't matter as Liverpool held on for the win. After producing an organised performance in the opening 45 minutes that would've delighted Chris Hughton, the five minutes after the restart undid all the Seagulls' hard work, and probably angered the Brighton boss in the process. The visitors were handed their goal in the 50th minute due to a rash and unnecessary challenge by Pascal Gross on Mohamed Salah inside the area that ultimately cost the hosts a point. Hughton however could take solace with the way his side stayed in the game throughout and losing by only one goal, compared to the 5-1 drubbing they experienced in this fixture last season. Starting XI: Button (6); Montoya (6), Duffy (6), Dunk (7), Bong (6); March (5), Gross (5), Stephens (5), Propper (6), Locadia (5); Murray (6). Substitutes: Knockaert (5), Andone (6), Kayal (5). ​Brighton's back four as a whole performed admirably over the course of the game, although Lewis Dunk caught the eye, with the England international seemingly in the right place at the right time to either head away or block a Liverpool shot. A moment of madness from Pascal Gross ensured Brighton left the game with nothing, as it was his poor challenge on Salah that resulted in the only goal in the game, while the German was largely ineffective in the attacking third barring a blocked shot. Salah was obviously looking for the penalty and Pascal Gross foolishly gave in. 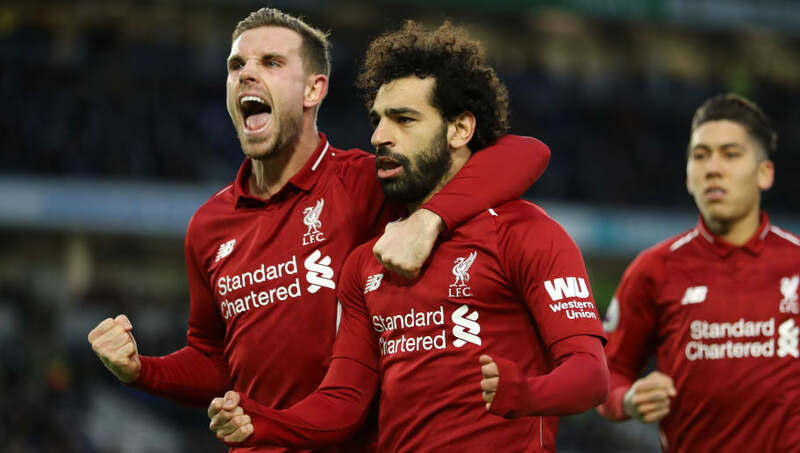 All the talk prior to the game at the Amex Stadium was regarding how Jurgen Klopp's side would react following back-to-back defeats, and to the credit of the current Premier League leaders they fought hard to earn their win. While the performance across the 90 minutes was far from perfect, especially in the first-half, Jurgen Klopp would've only cared about winning the three points, which is what Mohamed Salah's penalty provided, in order to open up a seven point gap over Manchester City ahead of their game against Wolves and put the pressure back on Pep Guardiola's side. Starting XI: Alisson (6); Alexander-Arnold (6), Fabinho (6), Van Dijk (6), Robertson (7); Henderson (6), Wijnaldum (6); Shaqiri (5), Firmino (5), Mane (6); Salah (7). Substitutes: Milner (6), Keita (N/A), Origi (N/A). Andy Robertson caused Brighton a number of problems all afternoon down the left, whether it be his runs in behind or his subsequent delivery once he got in position, which was usually on the money. In a fixture that announced the Scot in the Liverpool shirt last season, Robertson's performance proved once again why he's the Reds' first-choice left-back. What a player Andy Robertson is. Great engine and sweet left foot. Despite giving a typically energetic display, Roberto Firmino's touch at times was found wanting, while the Brazilian could've made the afternoon for ​Liverpool a much more comfortable one by converting Robertson's cross in the opening ten minutes of the game. It's another difficult fixture for Brighton next weekend, as Chris Hughton's side travel to Old Trafford in a weeks time to face a rejuvenated Manchester United. Liverpool meanwhile return to Anfield as they look to make it back-to-back wins when they host Crystal Palace.